Autumn is prime apple-picking time, and we’re always on the hunt for new dishes that incorporate this season’s most-celebrated staple. We can’t wait to try these three apple recipes shared with us courtesy of the nutritious meal-kit delivery brand HelloFresh. So skip the classic apple pie (okay, maybe not—make it for dessert!) and serve these creative recipes from HelloFresh instead. Preheat the oven to 400 degrees. Bring a large pot of water, the freekeh, and a large pinch of salt to a boil. Reduce to a simmer and cook for 20-25 minutes, until tender. Drain and rinse under cold water. Meanwhile, trim and halve the Brussels sprouts. Thinly slice half the Brussels sprouts into shreds. Toss the other half of the Brussels sprouts on a baking sheet with ½ tablespoon olive oil and a pinch of salt and pepper. Place in the oven for 15-20 minutes, until golden brown. Heat a medium pan over medium heat. Add the walnuts and cook, tossing, for 2-3 minutes until fragrant and toasted. Set aside. Heat 1 teaspoon olive oil in the same pan over medium heat. Add the shredded Brussels sprouts and cook, tossing, until softened, 3-4 minutes. Season with salt and pepper. Make the honey citronette: halve, peel, and mince the shallot. Zest and halve the lemon. In a large bowl, whisk together the shallot, honey, lemon zest, juice of half the lemon, 1 ½ tablespoons olive oil, and a pinch of salt and pepper. Core and dice the apple. 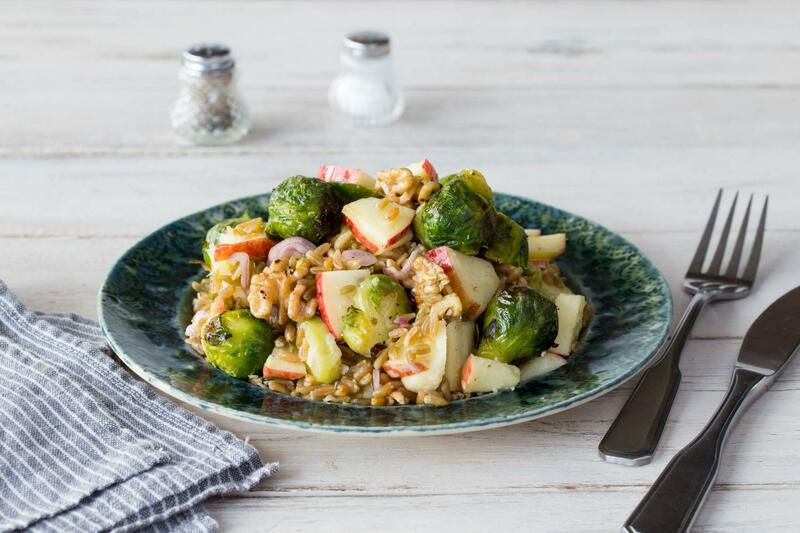 Toss the freekeh, shredded Brussels sprouts, Parmesan, walnuts, and apple into the citronette then season with salt and pepper. Plate the freekeh salad then top with the roasted Brussels sprouts. Enjoy! Cooking time: 35 minutes; serves two. Pre-heat oven to 400 degrees. Peel the sweet potato and cut into ½-inch cubes. Halve the fennel through the core, thinly slice lengthwise. Halve and thinly slice the apple. Strip the leaves off of the rosemary sprig. In a large bowl, toss the sweet potato, apple, fennel, and rosemary with 1 tablespoon olive oil and spread them out on a baking sheet. Roast for 20 minutes, tossing halfway through cooking, until the potatoes are tender. Heat 1 teaspoon olive oil in a pan over medium heat. Season the pork chops with salt and pepper on each side. Sear the chops for 2-3 minutes on each side. Transfer to the baking sheet in the oven and roast for 4-6 minutes, or until cooked through. Set aside to rest. In the same pan you cooked the pork chops in, add ½ cup of water and the stock concentrate. Stir in the mustard and cook over medium heat until reduced by half. Add ½ tablespoon butter and swirl the pan to combine. Taste and season with salt and pepper. 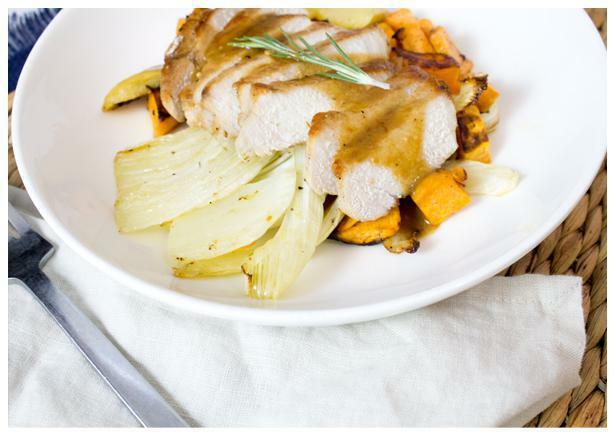 Finish: Thinly slice the rested pork chops. Serve them over the roasted vegetables with a drizzle of sauce on top. Cooking time: 30 minutes; serves 2. Preheat oven to 400 degrees. Remove stems and ribs from the kale and discard. Finely cut the kale into ribbons. Finley chop ½ cup of red onion. Core, seed, and remove white veins from the bell pepper. Cut into thin strips and then cubes. Juice the lime. Slice the mushrooms. Mince the garlic. Cut the apple around the core into 4 pieces, then cut into small cubes. In a bowl, combine apple, bell pepper, lime juice, and half the chopped onion. Toss and season with salt and pepper. Set aside in the fridge. Heat 2 teaspoons olive oil in a non-stick pan over medium heat. Add the kale and cook, tossing, for about 4 minutes, until wilted. Season with salt and pepper and set aside. Remove the sausage from its casing and add it to the same pan you cooked the kale in. Cook for about 6 minutes, breaking up the pieces, until no longer pink. Add the mushrooms, garlic, and remaining onion, and cook 5-7 minutes, until softened. Place two tortillas on a lightly oiled baking sheet. Top with a sprinkle of cheese, half the kale, and sausage mixture. Top with another sprinkle of cheese and another tortilla on top. Repeat with the other tortilla. Place in the oven and bake for 6-8 minutes, or until tortillas are slightly crisp and cheese has melted. 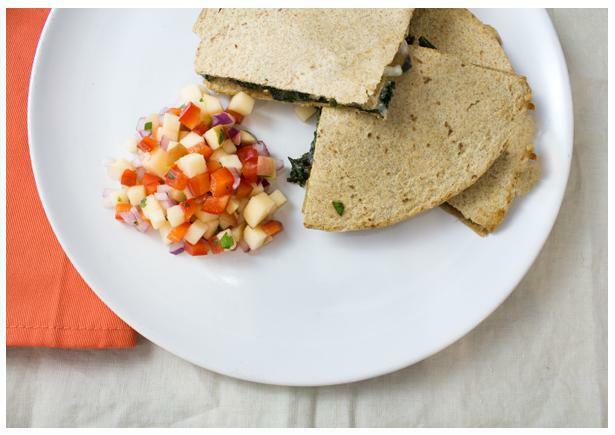 Finish: Cut the quesadillas into wedges and serve with the apple salsa on the side.